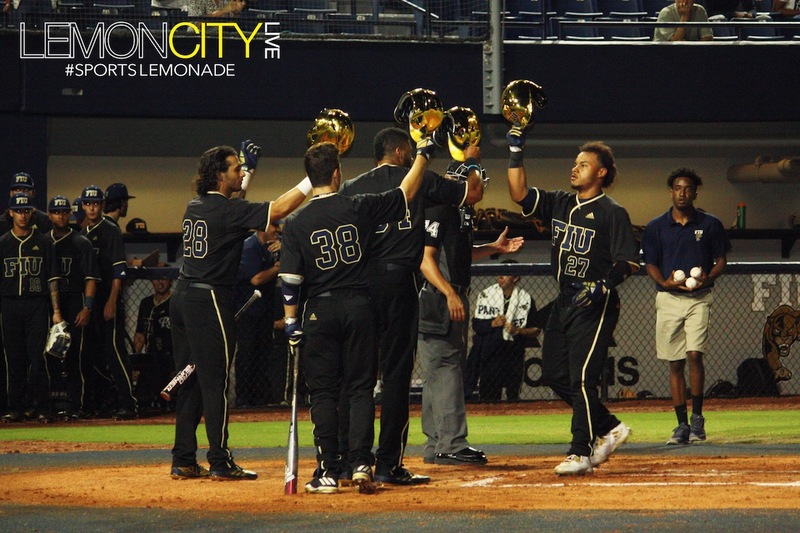 Miami, FL – The FIU Panthers overpowered the Florida A&M Rattlers Tuesday night, winning 7-2 on the strength of Jose Garcia’s two-run blast, taking the first of a two-game set. The boys struck early after Lorenzo Hampton was beaned by Rattlers starter Pedro de los Rios. Garcia came up to bat, and with a flawless swing, smashed the poor baseball up, up and away over the left-field fence, to put FIU up early. He wasn’t the only guy who shined tonight. 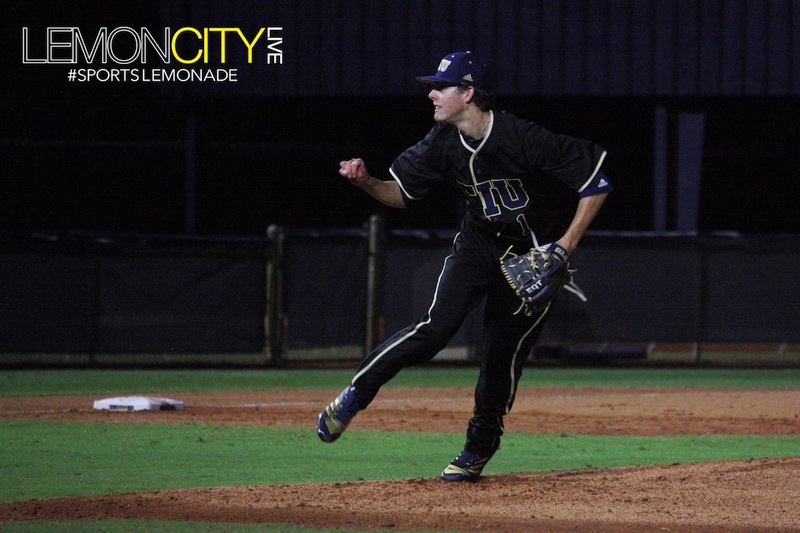 FIU Starting pitcher Nick MacDonald struck out 8 Rattlers on the night. Starting pitcher Nick MacDonald dazzled, lasting six innings, victimizing eight hitters, and holding Florida A&M to a paltry four hits to collect his first win of the season. In his previous start, MacDonald got a no-decision (Feb. 14), tossing 4 solid innings while fanning six, holding the Missouri Tigers scoreless. Not wanting to settle, the Panthers kept up the pressure in the third. Christian Khawam led off the inning with his third double of the year, followed up by Diandre Amion hitting one to right, scoring the run. FIU scored again in the fifth, as Javier Valdes smacked a two-bagger, bringing lead-off hitter and fellow sophomore Austin Shenton home to make it 4-0. For most of the game, the team remained firmly in control. The relief corps was sent in, as freshman William Saxton opened the seventh, striking out Brian Davis. However two singles, an error, and a wild pitch later, the shutout was lost, as Rattlers tacked on two runs, reducing the deficit by half. Luckily, Saxton settled down and retired the next two batters, courtesy of some great defensive moves by second baseman Eddie Silva. The @FIUBaseball #Panthers showed the @BaseballFamu #Rattlers some light, but immediately cut off the ⚡! The blue and gold struck back in the same inning, adding two more runs, including an infield single that Garcia just barely legged out, allowing Amion to race across home plate. It was an encouraging win for a team looking to gather momentum, especially after a discouraging start to the season where Mizzou outscored FIU 30-13. Put that into the “Must forget” folder. Silva and Amion finished the game going 2-for-4 with the latter recording an RBI and his fifth double of the year. Garcia had a fantastic night, going 2-for-3, going yard for the third time this season, and collecting 3 RBIs. The Panther pitching staff combined for 13 K’s Tuesday night. The Panthers will finish the series Wednesday night before hosting Jacksonville State later this week. The weekend’s visitors are 6-2, making them a formidable opponent for the team. If FIU can pull out a couple of wins in the series, they will be in good shape for when the Canes come to town next week.